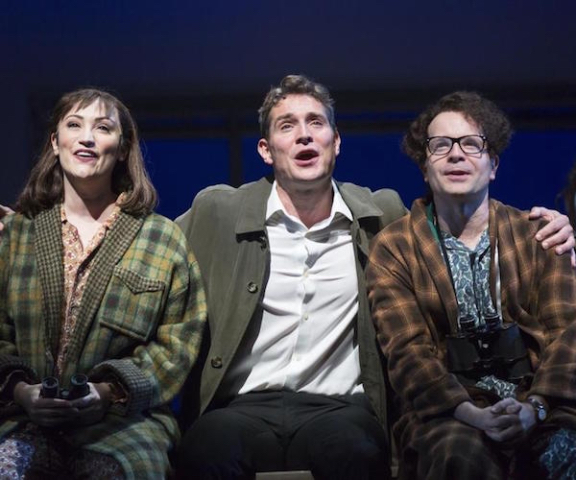 The Leads:Mary Flynn (Eden Espinosa), Frank (Mark Umbers), and Charley Kringas (Damian Humbley) in the Huntington Theatre Company production of “Merrily We Roll Along.” Photo: T. Charles Erickson. 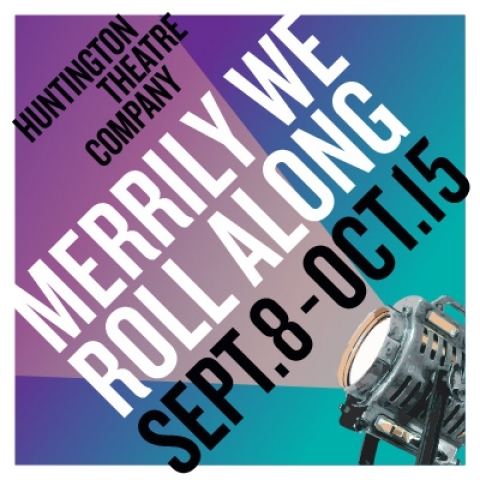 Merrily We Roll Along, Music and Lyrics by Stephen Sondheim. Book by George Furth. Directed by Maria Friedman. Music direction by Matthew Stern. Choreography by Tim Jackson, Staged by the Huntington Theatre Company at the Boston University Theatre, Boston, MA, through October 15. Sometimes failure becomes fulfillment, and that is the reversal that has been pulled off by Stephen Sondheim’s 1981 musical Merrily We Roll Along. Encouraged by creative producer/director Harold Prince, the musical was supposed to dramatize how the exuberance of youth morphs over the years into greed, jealousy, and multi-leveled over-indulgence in the entertainment industry. Anything but inspirational, the show became a rare Sondheim/Prince flop — the original production played to lukewarm reviews and only 16 performances. In retrospect, the explanation for the failure can be attributed to poor casting, including the use of some inexperienced performers, and cultural/political timing. The “Morning in America” of the Reagan Presidency didn’t tolerate the shadows cast by self-reflective entertainment. 2017 is different including a wonderfully talented cast and with the zeitgeist, the show literally rolls along. Later productions, featuring revisions by Sondheim and Furth, also helped. Huntington Theatre Company director Maria Friedman, who played the character of Mary Flynn in the 1992 revival of the show, recently remarked that the musical now had a better focus, that it emphasized “simple relationships, loyalty and honesty.” And it does. The show retains the elemental shape of its source (and namesake), a 1934 play by George S. Kaufman and Moss Hart. But Furth and Sondheim updated the musical to the years between 1957 and 1976. An edgy look at movie producer Frank Shepard’s lucrative and ego-rampant present is followed by a series of flashbacks that explore how the man’s professional and personal life unravels. Once a talented, up-and-coming Broadway musical composer he eventually abandons family, friends, and songwriting over two decades. He ends up as a selfish and hedonistic Hollywood mini-mogul. Traveling backwards, each scene illustrates Frank’s emotional breakdown, his devolution into the flawed man of show business. As a transition between scenes, the ensemble chorus sings reprises of the title song: the now seminal Sondheim tune “Old Friends.” In the thematic context of Merrily We Roll Along, it is at once somehow poignant and ironic as well as both hopeful and cynical. 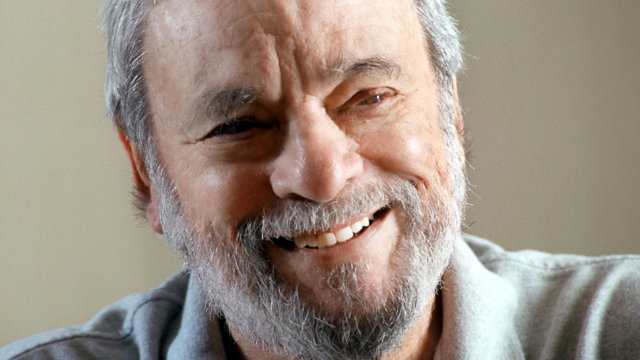 Merrily also includes Sondheim’s beautiful songs “Good Thing Going” and “Not a Day Goes By.” In addition to the musical intricacy of the score, the book makes challenging demands on the leads, who are asked to play world-weary and cynical old souls and then travel back through time, to convey their naive, foolish, and perhaps overly optimistic youth. Each of the HTC’s major cast members, lending their sensational voices and sympathetic characterizations, performs impeccably. Frank (played by Mark Umbers), Charley Kringas (Damian Humbley), and Mary Flynn (the wonderful Eden Espinosa) bring an impressive theatricality to their roles as very theatrical people. At first, these comrades-in-arms are disappointed with each others’ foibles and happy for each other’s individual triumphs. But, as in so many other Sondheim shows, a wistfulness, a bittersweet melancholia infuses itself into the proceedings. Here, by its second and third rendition, “Old Friends” seems rather more haunting than it is soothing. Adding considerably to the production’s quality are Mark Umbers and Damian Humbley, who played Frank and Charlie respectively in the West End revival of the show, which won the Olivier Award for Best Musical. They reprise their roles here: Umbers terrifically balances Frank’s manipulative personal magnetism with an equally manipulative vulnerability. Humbley’s Charley poignantly dramatizes the pain of an artist who is betrayed by his former collaborator. Rounding out “the friends” is Espinosa, who has performed in Wicked and Brooklyn on Broadway. She is brilliant both as the voice of reason and Frank’s unrequited love. Her version of Mary is the portrait of a hard-drinking earth mother, initially a fragile flower who is forced to grow prickly thorns. Other performers who make terrific contributions are Boston theatrical stars Aimee Doherty as Gussie Carnegie and Jennifer Ellis as Beth. The flexible set and (at times) sumptuous costumes by Soutra Gilmour alternate deftly between realism and abstraction. Somehow scenes manage to be both visually entertaining yet right for the period. The lighting design by Philip S. Rosenberg is as seamless as Tim Jackson’s choreography. (The choreographer and set/costume designer are from the award-winning London revival.) Matthew Sterns’s music direction is sonorously superb. Friedman’s direction of Merrily is subtle and graceful; no doubt her stint as the director of the acclaimed London revival has given her a refined confidence in this go-around at the material. The flashbacks are done with aplomb, and her sensitivity to the show’s psychological insights pay off throughout the production. She deftly underscores — yet somehow reconciles us to — a script filled with broken hearts and figures who both lack, and dismiss, empathy. Merrily We Roll Along, until recently, was categorized as a Sondheim-ian misstep, an occasion when he didn’t reign in his yen for a touch of the neurotic, when darkness wasn’t balanced with sufficient light. But this outstanding production proves that this show is very much Sondheim being Sondheim — and that is pretty damn good. This review is republished by permission of Arts Fuse where it was previously published.